I’m Back with Summer Brights! A big thank you to all my friends (online and in real life!) for sticking around. My family and I are doing well and the support we’ve received has been awesome. So let’s get back to the fun stuff! I got this whole outfit on the fly at Target in one trip! 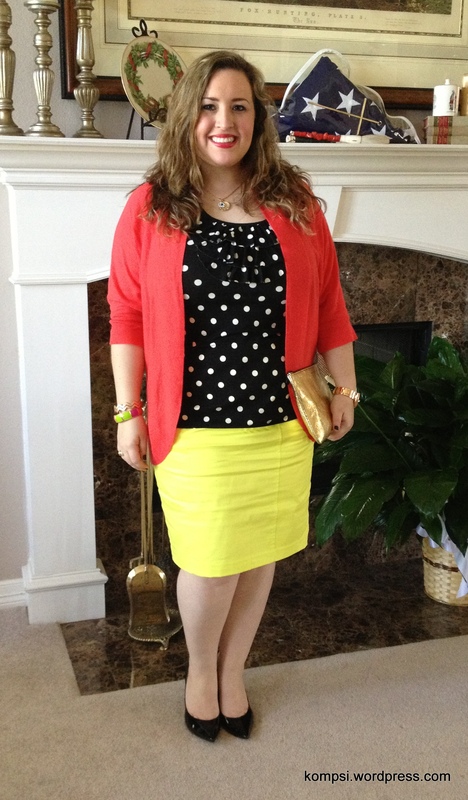 I found the pencil skirt first and I really gravitated to the bright yellow, it’s such a fun color. I knew I didn’t have anything to wear with it in my own closet, so I started looking around. I found the cardigan next and I thought the melon color complimented the yellow nicely. I love to color block! After that, I started to look for something neutral to wear underneath, in order to not be a neon nightmare. When I saw this top with the polka dots and ruffles, I knew it would be the perfect neutral and the details added a fun touch. Since my last post, I got my hair highlighted and got three inches taken off the length. I love it! I enjoy having my hair lighter, I used to be totally blonde for almost four years until I went brunette January 2012. Love it! So cool that you found it all at Target. It gives me hope that I can create a cute outfit! (And by that I mean copy exactly what you are wearing here.) I always want to dress cute, but am severely fashion impaired, and thus end up in jeans and a tee-shirt most days. Thanks! I LOVE Target and I’m really not exaggerating when I say I buy most of my clothes there. I usually shop there, JC Penney’s and Old Navy, I’m all about cute, good quality clothes at affordable prices.